The DUB-1340 4-port USB 3.0 Hub connects the new generation of USB 3.0 devices - such as printers, camcorders and USB Hard Drives - to your computer at the fastest speeds. 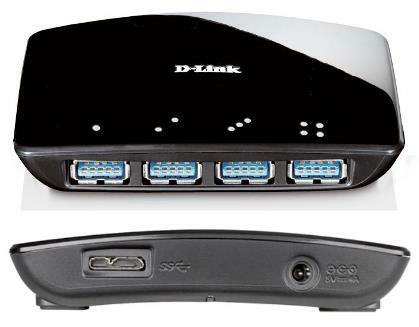 The D-Link 4-Port SuperSpeed USB 3.0 Hub (DUB-1340) provides four additional USB 3.0 ports for your PC, allowing you to connect USB devices such as external storage, digital cameras, printers, and more. Providing data rates of up to 5Gbps - 10 times faster than USB 2.0. You can transfer your photos, music, and HD movies to a USB 3.0 external storage device faster than ever before. USB 3.0 allows you to transfer data at blazing speeds of up to 5 Gbps - up to 10 times faster than USB 2.0. You can back up your photos, music, and HD movies to a USB 3.0 external storage device faster than ever before. Each port delivers up to 900mA of power with the included power adapter for faster charging and power hungry USB devices. Backward compatibility with USB 2.0 and USB 1.1 means that you can connect any USB device to the DUB-1340. Each port automatically detects USB type and transfer data at a maximum rate for each individual port. If you need more ports, you can connect additional USB hubs to support up to 127 devices.